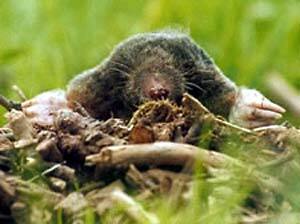 The Mole - Its fore-paws are made broad like a shovel, and are very strong. remember but two places in the Bible where this animal is mentioned. One is in Leviticus, where it is named among the unclean animals which the Israelites were forbidden to eat; and the other is this verse in the second chapter of Isaiah: "In that day a man shall cast his idols of silver, and his idols of gold, which they made each one for himself to worship, to the moles and to the bats." Have you read about the first missionaries who went to the Sandwich Islands? And do you remember that although the people had always been worshippers of idols, they had cast them all away just before the missionaries came? That was a very wonderful thing to happen; and it seems as though God was making these poor people ready to hear about the Savior, when the missionaries should come. Well, this verse in Isaiah declares that the same thing will happen by and by over the whole earth. You know that there are now millions and millions of poor heathen who worship nothing but images of gold, or brass, or stone; but the day is coming when not an idol shall be seen, and no being shall be worshipped but the true God. The mole lives under ground, and the bat in gloomy, dark caves where nobody thinks of going; so when it is said that the idols shall be "Cast to the moles and to the bats," it means that they shall be thrown away in dark and neglected places, just as we throw away old shoes, or any thing that we care nothing about. Will you try to remember this verse about the idols? Perhaps you may live to see the near approach of that day. The mole is a very curious animal in its appearance and in its manner of living. It is almost always under ground, and we should think that the little creature could not be very happy; but its skin is as smooth and handsome as that of any animal, and it seems very well contented with its dark home. God made it to live there, and he has given it just such a body at it needs. It is covered with fine, short, silky hair, almost like soft velvet, so that the earth does not stick to it; and its legs are very short, so as not to be in the way. If its legs were long it could not get through the ground very well, you know. Its eyes are very small, because it does not need to see much, and they are almost buried too under its soft fur, which keeps out all the dust and dirt. The opening of the ear is covered in the same way, so that nothing can hurt it. Its fore-paws are made broad like a shovel, and are very strong; each one, too, has five short fingers with which the earth can be removed. The nose is sharp and bony, and this helps the mole to work its way through the earth. They throw up the earth when they make their houses under ground, and in this way mole-hills are made. They like to work at morning and evening, and also after a shower, when the earth is damp and soft, and easily moved. The mole is larger than a mouse, but not as large as a rat. It eats insects and worms, and sometimes the roots of plants.